Olive Oyl - BN Licensing B.V.
She made her showbiz debut way back in the winter of 1919: Olive Oyl. She was the BIG star of Elzie Crisler Segar’s popular comic strip, “Thimble Theatre.” For over 9 years Olive Oyl was the star of the strip, but then Popeye sailed in. The strip was later re-titled, ”Popeye.” Why he gets top billing is something she rather not discuss (men!). Olive Oyl is known to many as the “First Lady of Cartoons” and with her gorgeous visage pickle nose, big feet and all she appeared in nearly 25,000 comic strips, 750 animated cartoons and countless comic books - published all over the whole wide world! Since the 30's Olive Oyl is not just a cartoon star, but she made several radio recordings and songs. In 1980 she was brought to live in the classic film from Paramount Pictures, where she was played by Shelley Duvall. Throughout her extraordinary career, Olive has been sweetheart and sailor, fighter and flirt, dancer and diva. One thing is for certain: Olive Oyl always has been and always will be an individualist and her own woman. From the comic to the big screen, to a world of licensing and digital media .. 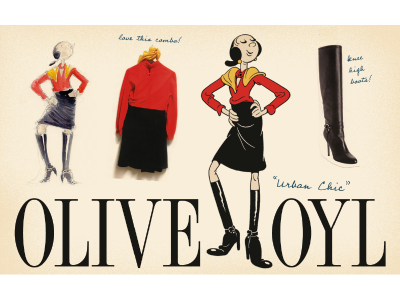 This beloved comic icon Olive Oyl has, and does it all! ©2016 King Features Syndicate, Inc. ™Hearst Holdings, Inc.